When the plant blooms (every decade or so), that spadix actually heats up to about 90 degrees. 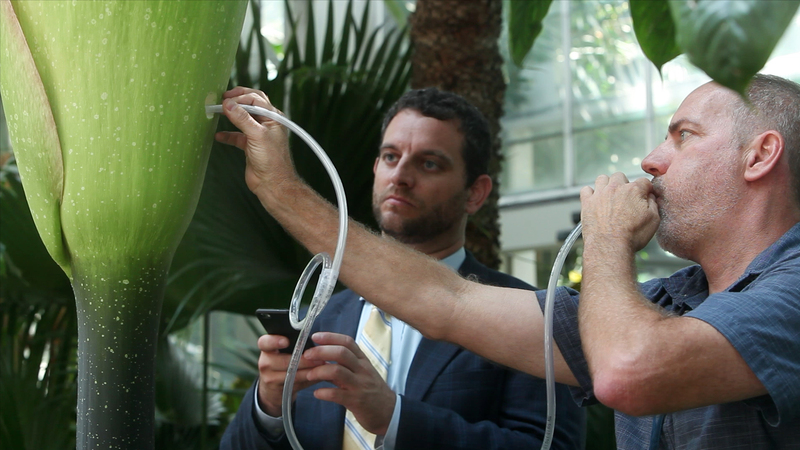 The stench that inspires its common name — the corpse flower — comes from a putrid blend of chemicals the bloom sends into the air. The odor has notes of old fish, unwashed feet and rotting cabbage. This plant is pretending to be a dead animal. Why? In the wild, when insects searching for carrion are tricked into entering the corpse flower, they become unwitting aides in the plant's reproduction, carrying pollen from one corpse plant to another corpse plant nearby. In recent years, the corpse flower's deceit has attracted another pollinator: humans. Botanical conservatories from Denver to Sydney want the stinky crowd-pleasers in their collections. And to keep the domesticated corpse flowers going, botanists must take the place of insects. They carefully collect corpse flower pollen and send it in the mail to the next garden down the road. Want to learn more about the corpse flower? Check out Skunk Bear's latest video. Got your own science question for us? Send it our way here. We'll be answering questions from NPR's Skunk Bear community every other Tuesday.